Thrips have recently surged to prominence as insect pests of field, plantation and glasshouse crops in many countries, associated with increased international trade in fresh vegetables, fruit, flowers and plant propagation material. They can cause direct feeding damage to the aerial parts of plants, resulting in yield loss and spoilage, and some are vectors of destructive plant viruses. Their minute size and secretive habits make them particularly difficult to detect and control. 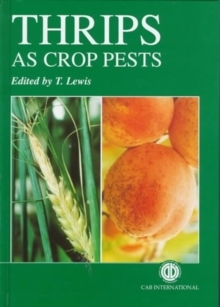 This book, containing contributions from several world authorities from Europe, the USA and Asia, is the most comprehensive treatise on thrips as crop pests ever to be published. It brings together a vast amount of modern work set against a wealth of background knowledge, covering basic biology, ecology, applied science and pest control. The result is a book indispensable for agricultural advisers and growers concerned with thrips pests, and a unique reference source and stimulus for research entomologists studying these intriguing insects.